Jessica Cruz is a fictional superhero appearing in American comic books published by DC Comics. Created by Geoff Johns and Ethan Van Sciver, she is a member of the Green Lantern Corps and the Justice League. 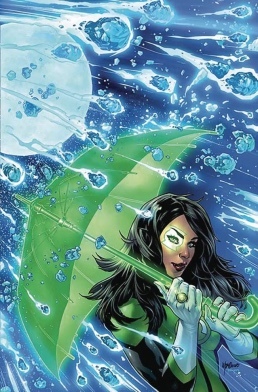 Her first full appearance takes place in Justice League #31 (August 2014), which is also her first cover appearance. Cruz's original design was based on the actress Penélope Cruz. DC Comics confirmed that Jessica Cruz is a dual national Mexican American Latina/Hispanic, and currently resides in Portland, Oregon. Jessica Cruz's name is mentioned and her right hand appears briefly in a single panel of the 2013 issue Green Lantern #20. Her next appearance comes in Justice League vol. 2 #30, when the Ring of Volthoom locates her, and she then gains her powers in the following issue - Justice League vol. 2 #31. She was dubbed "Power Ring" while she was host to the Ring of Volthoom but is not a member of Crime Syndicate of America. Jessica becomes an official member of the Green Lantern Corps, in the Prime Earth reality, at the end of Justice League #50: The Darkseid War. Jessica Cruz and her friends are on a hunting trip when they accidentally stumble across two men burying a body. The men brutally murder her friends. Jessica manages to escape but is left traumatized. The Ring of Volthoom, which feeds off fear and had abandoned Power Ring after his death during the Crime Syndicate's incursion to Prime Earth, is able to locate her due to her trauma. Unlike the previous ring bearers, she does not willingly accept the ring, but is forced to accept it. The Ring tortures Jessica with physical and psychological pain. The Ring explains that it is using Jessica to attract the being that destroyed Earth-Three to Prime Earth because he is now dying (for reasons not explained) and wants to take the planet with him. Batman is able to de-power the ring after convincing Jessica to face her fears. Jessica later succumbs to effects of the AMAZO virus, but is soon cured. Hal Jordan returns to Earth to teach Jessica how to control her ring. When Darkseid's daughter Grail arrives on Prime Earth, she attacks Jessica and uses her ring to open a portal to Earth-Three, allowing the Anti-Monitor to cross over to the Prime Earth. Jessica and the rest of the Justice League are then transported away by Metron. After this the Justice League decides to free the Crime Syndicate to help in the fight against the Anti-Monitor and Grail. Jessica, Cyborg and Mister Miracle head to the prison and the close proximity to the Syndicate allows the Ring to possess Jessica's mind and body. During the Justice League's confrontation against Grail and Darkseid, Grail manages to separate the Flash from the Black Racer, which immediately begins to pursue the Flash. Realizing the Racer will not leave the physical plane of existence until it reaps a soul, Jessica convinces Cyborg to tap into the ring's technology and override Volthoom's control over Jessica's body for a few seconds. This allows Jessica to jump between Flash and the Black Racer, allowing the incarnation of death to apparently kill her. Jessica survives, and it is revealed that the Black Racer killed Volthoom instead, causing the ring to crumble into dust. Immediately afterwards, a Green Lantern ring descends at the battlefield and transforms Jessica into a new Green Lantern. In Green Lanterns: Rebirth #1, she meets Simon Baz when he is investigating an alien intrusion. This turns out to be a Manhunter who battles the two of them. It is then revealed to be a training exercise run by Hal Jordan to test the two rookies. Hal combines Jessica and Simon's power batteries in order to make them work as a team and puts them in charge of protecting Earth. When confronting the threat of the Phantom Ring, a prototype power ring that can channel the entirety of the emotional spectrum at the cost of rapidly shifting depending on the emotional state of the user, Jessica confesses to her own doubts about whether she deserves her ring given the unconventional circumstances of her recruitment. However, her fears are assuaged when she temporarily dons the Phantom Ring and it automatically transforms her into a Green Lantern, allowing Jessica to recognize her success at overcoming her old fears rather than believing that she was defined by that experience. She is later sent to space to train with the Green Lantern Corps and is under the orders of Guy Gardner who just pushes her around and berates her until she has had enough and attacks him; Guy later strikes a deal with her that if she successfully defeats him in combat he will not talk about the encounter, which she is able to do. Later, Jessica is assigned to monitor the newly-released Ghost Sector of space (a region consisting entirely of planets stolen by Coluans that was freed by the Justice League); while there, she encounters Cyborg, Starfire and Azrael piloting a skullship commandeered from Braniac in an attempt to enter the sector. Attempting to stop them, she finds herself trapped in the Ghost Sector alongside the others, and they band together to investigate the mysterious region of space as the Justice League Odyssey. As a Green Lantern, Jessica is capable of projecting energy-based constructions, flight, and utilizing various other abilities through her power ring which are only limited by her imagination and willpower. She initially experienced some trouble in creating constructs with the ring, but has overcome this limitation while training with Simon Baz. While Jessica was briefly a Power Ring she initially had no control over the ring. Under the tutelage of Hal Jordan she learns to overcome the evil powers within the Ring and use it effectively, until Volthoom possesses her body. Her feelings of courage help Cyborg decipher the alien language of the ring and he is able to let her overcome Volthoom's influence for a moment, and jump between Black Racer and Flash which ends up destroying Volthoom and the Ring, freeing Jessica. Jessica is also an adept survivalist and was able to live by herself for three years. She was seen wielding a shotgun with proficiency when she was able to hit the Ring of Volthoom and keep it at bay for a few moments before it made her its host. It has recently been revealed that Jessica's ring is partly fused with Volthoom's Travel Ring, due to it being one of the first seven power rings created by the rogue Guardian Rami during Volthoom's first attack on Oa. This connection to the travel ring allowed Volthoom to make his initial journey to the past, but also resulted in Jessica accidentally using the ring to send herself and Simon over ten billion years into the past to escape Volthoom only to find themselves at the time of Volthoom's assault on Oa. Jessica Cruz appears in the TV series, DC Super Hero Girls, voiced by Myrna Velasco. Jessica Cruz appeared in Lego DC Super Hero Girls: Super-Villain High, voiced by Cristina Milizia. Jessica Cruz appears as a member of the Justice League in Lego DC Comics Super Heroes: Aquaman: Rage of Atlantis, once again voiced by Cristina Milizia. Jessica Cruz appeared in the 2019 DC Universe Original Movie Justice League vs. the Fatal Five, voiced by Diane Guerrero. She has a form of depression that makes her afraid of most things outside her house; to her annoyance, a Green Lantern ring chose her, but she refuses to use it or join the Justice League despite Wonder Woman's attempts to persuade her. As a result of her timidness, the Fatal Five targeted her, so they could force her to help them free Emerald Empress and Validus from the science cells on Oa. Meeting Star Boy, who also suffered from some kind of mental crippling, Jessica was able to rise above her fears and become a great Green Lantern. Jessica Cruz appears in the web series DC Super Hero Girls as Earth's new Green Lantern, voiced by Cristina Milizia. She makes her animated debut in this series. Jessica Cruz is a playable character in the mobile app version of Injustice: Gods Among Us. She was a part of an update that included adding elements from DC's Rebirth to the game. Jessica Cruz is a playable character in the DC Legends mobile app game. She is one of several Green Lanterns included in the game and is classified as a hero with an energy affinity. Her bio in the game says: As the first Earth woman to earn a Green Power Ring Jessica Cruz fights to prove herself a worthy Lantern. After barely escaping a criminal gang that murdered her friends Jessica Cruz struggled with crippling fear and guilt. This made her the target of a power ring from the Anti-matter universe that fed on her fears and controlled her actions. But Jessica fought back breaking free and earning a place in the Green Lantern Corps. Now as a rookie recruit she fights her self-doubt while defending the Earth from cosmic threats. Jessica Cruz appears as a playable character in Lego DC Super-Villains. ^ "Penelope Cruz's biography on IMDb". Retrieved 20 October 2017. ^ ""Green Lanterns" Core: Who Are Simon Baz and Jessica Cruz?". CBR. 27 June 2016. Retrieved 26 January 2019. ^ Pockross, Adam (7 May 2018). "Dive into our exclusive LEGO DC Super Heroes - Aquaman: Rage of Atlantis trailer premiere". SYFY WIRE. Retrieved 26 January 2019. ^ Couch, Aaron (January 7, 2019). "'Justice League vs. The Fatal Five' Sets Voice Cast (Exclusive)". The Hollywood Reporter. ^ Milizia, Cristina (9 February 2018). "Thrilled to be voicing #GreenLantern #JessicaCruz in "Ring Me Maybe Parts 1-4" for #DCSuperHeroGirls! She is such a relatable character & the series provides courageous, strong, female role models for kids. Check it out!https://youtu.be/L-XimpSg_GY". twitter.com. Retrieved 26 January 2019. 100 Days to Heaven is a 2011 Philippine fantasy comedy drama television series directed by Malu L. Sevilla, Jojo A. Saguin, and Don M. Cuaresma. The series stars Coney Reyes and Xyriel Manabat as Anna Manalastas, and Jodi Sta. Maria as Sophia Delgado and Trisha Manalastas, with an ensemble cast consisting of Joel Torre, Dominic Ochoa, Smokey Manaloto, Valerie Concepcion, Rafael Rosell, Jewel Mische, Emmanuelle Vera, Neil Coleta, Louise Abuel, Rustica Carpio, and Noel Trinidad in their supporting roles. The series premiered on ABS-CBN's Primetime Bida nighttime block and worldwide on TFC, replacing Mutya from May 9 to November 18, 2011. This is Coney Reyes' first lead role after having already portrayed supporting roles in teleseryes such as Sa Puso Ko Iingatan Ka, Ysabella, and Rubi. Cruz is a surname of Iberian origin, first found in Castile, Spain, but later spread throughout the territories of the former Spanish and Portuguese Empires. In Spanish and Portuguese, the word means "cross", either the Christian cross or the figure of transecting lines or ways. For example, in the Philippines, the adopted Tagalog word is rendered to "krus" in plain usage, but the Spanish spelling survives as a surname. The word "Cruz" (Spanish for "Cross"), as well as "Vera Cruz" ("True Cross") and "Santa Cruz" ("Holy Cross") are used as surnames and toponyms. Its origin as a surname particularly flourished after the Alhambra Decree of 1492 and the increasing activities of the Spanish Inquisition, when New Christian families with Crypto-Jewish, Moorish, and/or mixed religious heritage converted to the state-enforced religion of Catholicism and subsequently fashioned and adopted surnames with unambiguous religious affiliation. David Sanes Rodríguez (1954 – 19 April 1999) was a native of Vieques, Puerto Rico whose death became a rallying point for those opposed to the U.S. military presence on and use of his home island for live-fire bombing practice. Sanes Rodríguez's death sparked the organization of the Cause for Vieques and a series of protests by residents and activists that culminated in the US Navy abandoning Vieques. Diane Guerrero (born July 21, 1986) is an American actress and author. She is known for her roles as inmate Maritza Ramos on the Netflix series Orange Is the New Black and Lina on Jane the Virgin. Guerrero grew up in Boston and remained there after the rest of her family was deported to Colombia. She is an advocate for immigration reform. Her role on Orange Is the New Black has contributed to three consecutive wins for the Screen Actors Guild Award for Outstanding Performance by an Ensemble in a Comedy Series. Guerrero is the author of In the Country We Love: My Family Divided, a memoir about her parents being detained and deported when she was fourteen. Jewel Fatima Avejade Mische-Kurzer (born 29 June 1990) is a former Filipina model and actress. Justice League vs. the Fatal Five is a 2019 American animated superhero film produced by Warner Bros. Animation and distributed by Warner Home Video. Featuring the DC Comics team of the same name created by Gardner Fox the film will be the thirty-fourth in the DC Universe Animated Original Movies series. It had its world premiere at WonderCon Anaheim 2019 on March 29, 2019, was released on Digital HD on March 30, 2019, and it is scheduled to be released on 4K Ultra HD, Blu-ray, and DVD on April 16, 2019.Announced at San Diego Comic-Con on July 20, 2018. The film features Kevin Conroy, Susan Eisenberg, and George Newbern reprising their roles as Batman, Wonder Woman, and Superman from Justice League Unlimited and other DC productions. The Green Lantern Corps that appears in fictional stories published by DC Comics has at least 7200 members, two per sector (originally 3600 with one per sector), in addition to assorted other members who fulfill roles other than patrolling. Although seven characters—Alan Scott, Hal Jordan, Guy Gardner, John Stewart, Simon Baz, Kyle Rayner, and Jessica Cruz—are primarily associated with the name, a number of other members of the Corps have appeared in DC's comics.